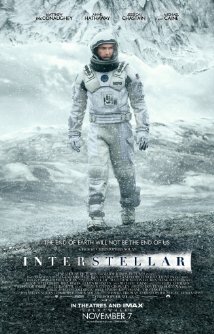 Interstellar: How Much Would You Sacrifice to Save Humanity? Every time I hear a story of someone who died to spare the life of another—a first responder, a parent in place of a child, a soldier who took a bullet for a comrade—I wonder whether I would have done the same. I like to think I’d be altruistic if it came down to saving someone else, that if push came to shove, I’d be brave. I love my life and I hope to live a long, healthy, happy existence on this Earth, but I’m not afraid of being dead either. But whenever I think about that situation, I think about saving an individual, a current life. That’s the motivation of former NASA pilot Cooper, Matthew McConaughey’s character in the recently released movie Interstellar. The earth is dying, and what remains of NASA has established what they call the Lazarus missions. Pilots have taken a one-way trip into a wormhole to see if the planets they find on the other side are habitable. Transmissions from three of the pilots indicate they may have found hospitable worlds. Unfortunately, time and resources have run out. NASA asks Cooper to go on the final mission. Either they’ll be able to transmit back the data needed on the potential planets to evacuate what remains of Earth’s population (including Cooper’s children) or they’re supposed to use pre-fertilized eggs in an incubator to reseed humanity on another planet, sacrificing those left on Earth but saving the human race. And Cooper agrees, even though it might mean never seeing his children again, because he believes that at least he can save their lives. The scientist in charge promises him that his children will be among those evacuated from Earth. What Cooper finds out is that the NASA scientist in charge never intended to save the people left on Earth. The real plan all along was to save humanity as a species and sacrifice everyone remaining on Earth, including Cooper’s family. He lied to everyone involved in the final mission because he believed that, while we’ll sacrifice everything to save those we love, we’re much less likely to sacrifice everything to save the human race as a generic whole—especially if doing so meant our loved ones would die. And while I don’t condone his methods, I think I agree with his conclusion. I’m not sure I’d sacrifice everyone I love to save “the human race.” I’m not sure I place a higher value on “the human race” as a species than I do on the already living people who belong to humanity. I don’t think I’d take comfort knowing that “the human race” would survive if it meant sacrificing everyone currently alive to ensure that survival. It begs the question: Is the value in humanity as a species or is the value in each individual life? I panned this movie in my blog post “Movie Reviews.” Apparently, you saw something I didn’t. Hard sci-fi, even dystopian sci-fi, doesn’t translate well to the silver screen…at least that’s my take. Hard scifi is always going to be more difficult to turn into a movie because of the necessarily technical nature of it. I do like to see it tried occasionally. Thanks for the link to my old blog post, a wee bit of self-promotion more than a review. To be fair, I hadn’t seen the movie at that time, but I’d heard that Kip Thorne was the consultant, hence the post. I like the point you mentioned. Although both my trilogies are dystopian, individual characters, striving against terrible odds, often pull off something positive. Your case of one person sacrificing another for the sake of all humanity is another twist on this theme. I really need to see this movie because my kids said it was awesome, like in one of the best movies of the year. Anyway, I agree with you: Jesus died for the individual, not the group. People seem to fall solidly on one side or the other about the movie itself. I’ve heard from many people who really enjoyed it and others who hated it. I hope you enjoy it as much as your kids did! Now, is the value in humanity as a species or is the value in each individual life? I think both because the individual is part of what makes up the whole sum of humanity. And someone gave his life so that all mankind could be saved. Although unfortunately that doesn’t mean that will happen. That lies on the individual. I loved this movie! I was blown away and speechless by the end. Amazing! I am quite happy to declare myself on the ‘awed’ side of the fence, but I’m certainly not miffed at those who didn’t enjoy it. It definitely is a movie that people would either really like, or really dislike.